If using a sat nav to find us, please use the postcode M3 1EU. The Booth Centre is located on Pimblett Street, on the corner of Park Street. It can be found by turning onto Park Street from the bottom of Cheetham Hill Road. 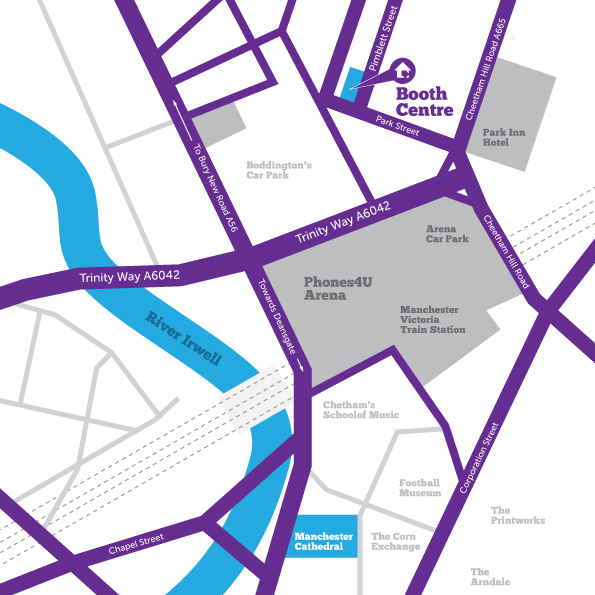 Parking is available at the bottom of Dutton Street near the Manchester Arena, or the Total Car Park in the old Brewery's site off Great Ducie Street. A limited number of cars are allowed to park outside the building briefly if you are just dropping something off. The Centre is usually open from 8am to 4pm Monday to Friday. ​If you are homeless or know someone who is, you can visit www.streetsupport.net for information about other services near you. Register to receive communications from the Booth Centre about our news and events by email. If you would like to make a suggestion about how our services could be improved, or to complain about the Booth Centre, please see our suggestions and complaints page.